The Solid End Link or SEL bracelet. You can find this bracelet standard on Steel Submariners with Date (16610) produced after 2001 or so. The solid end link bracelets added a little bit of weight to the watch, but more importantly, it helps keep the bracelet from stretching at the end piece. Watches without the SEL bracelet will have a more vintage feel. On 18K and Stainless Submariners this feature also coincides with what is known as the ‘gold through buckle’ meaning the gold stripe from the band is continued into the buckle, this feature was introduced as early as 1999 in the 16613. Solid End Link on the left, hollow on the right. Take a look at the side of the case. 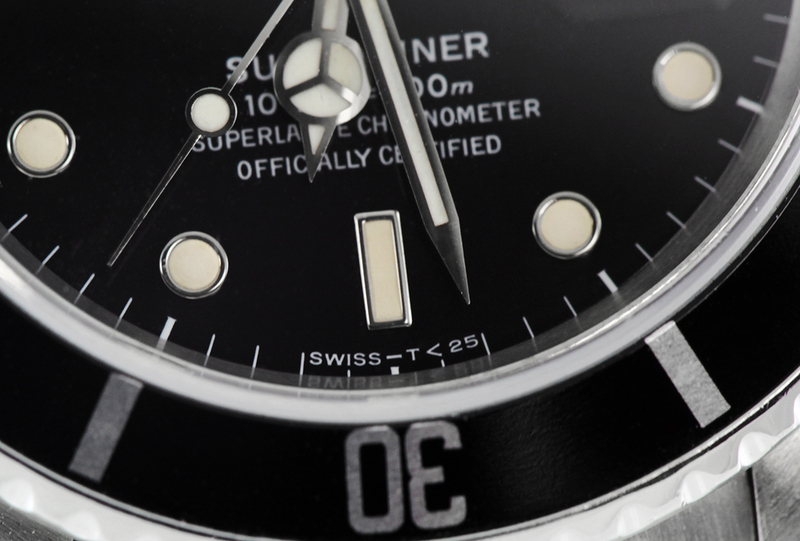 If the Submariner Date was made before 2003 or so, it will have holes going through the lugs. These would allow you to easily remove the bracelet which is handy if you intend to wear the watch on a strap. 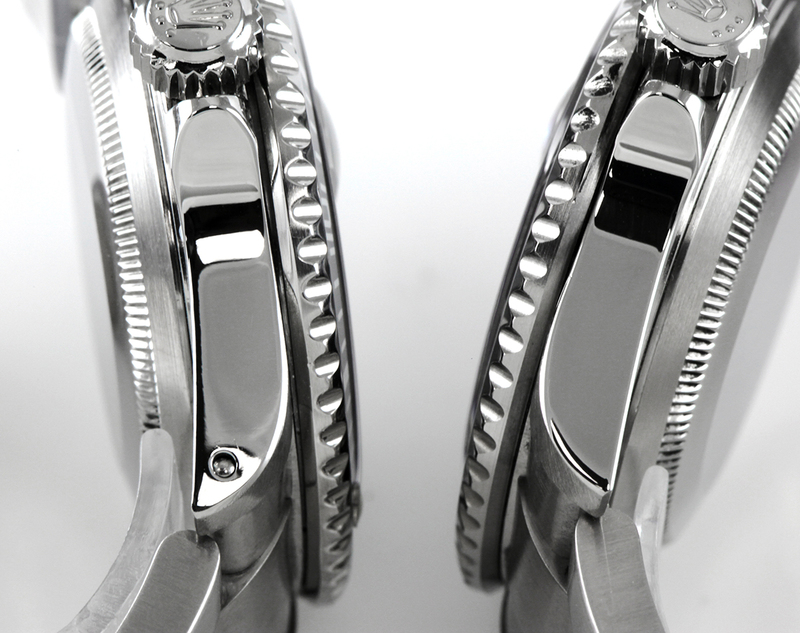 However, Rolex found that most users never removed the band, so the holes have disappeared on modern pieces. Luminova is phosphorescent and requires exposure to light during the day to glow in the dark, it is the standard on Swiss watches. Tritium is radioluminescent and has a half life of about 15 years, since this material was phased out in the 1990s, most Rolex Submariners with this material will no longer glow in the dark. The basic thing to know here is that if you don’t see a T near the Swiss at the very bottom of the dial, it is not a tritium dial. Tritium develops a nice patina with age and is often of interest to collectors for this reason. Our listings will always indicate tritium if it is present on the dial. 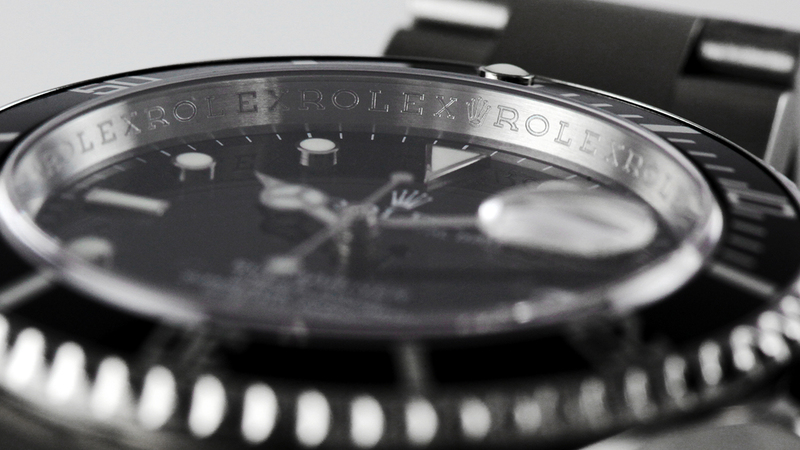 This is the ‘ROLEX ROLEX ROLEX’ engraving that you can see just under the crystal around the dial. This was a transitional feature of the 16610 in 2007 – 2009 as it was becoming standard on all Rolex models. It doesn’t necessarily add to the enjoyment of the watch (some people even prefer the cleaner look of the earlier models). But, since this is such a transitional feature, it can be sought after by collectors. If you’re looking for the differences between the Submariner Date (model 16610) and the ceramic bezel Submariner Date (model 116610) there have been a number of changes which I’ll detail in a later blog post. Bernard Watch always stocks Rolex Submariner 16610 Watches. I have worn my 16610 every day since my parents gave it to me as a 21st birthday present in 1989. It is a tritium dial and has long since gone dark. When new that face lit up so bright it would about keep you awake! i love this watch! It gains about four seconds per week and in the almost 25 years I have had it it has only failed once. I was out hunting and the mainspring broke. It felt like a pager going off on my wrist. I have worn my Submariner since 1985 (also a 21st birthday). It has been in multiple combat zones and keeps going. Over the years, I have been through a few stretched bands, 2 crystals, and multiple overhauls (last one got new hands, face, and bezel insert that were faded – glows in the dark again!). I love the watch and wear it everyday as well. My backup watch is a 1964 GMT Master that my dad bought 3 days before I was born (handwritten receipt from the Tokyo Army Exchange with box and wallet). It was overhauled a few years back right before my dad passed. It keeps almost digital time. Thanks for sharing your Rolex experiences Eric! Rolex knows how to make ’em! I bought a Rolex Submariner 2 years ago from a well regarded jewelry store. it is the Submariner two-tone 16610 in black/gold. I have the serial number which states it was made in about 1987. I was at the jeweler the other day and he was trying to talk me into buying a new one. Are there any advantages/disadvantages to buying a new year model in the same watch? Thank you. A newer Submariner (early 2000s) would have the gold all the way through the buckle, heavier Sold End Link bracelet as well as working Luminova compared to the no longer working Tritium. A brand new Submariner would have an even heavier bracelet with more gold content, milled buckle, ceramic bezel, slightly more robust case and larger luminous. So, yes, there are clear advantages. The disadvantage is the price, the newer models are priced accordingly for those features. Thanks for the feedback P.J. I don’t mind paying more for extra features and better quality. Obviously most things do improve with time. So let me ask you this. Is there much of a difference between an early 2000s Submariner and one made in 2012/2013? Thanks again!! Does the serial number begin with R? If so you have a mid 1987 thru 1988 sub. These are the first Rolexes with a letter prefix because they did not want to proceed past serial number 1,000,000 numerically. This is also the first production year of model 16610 and also the first production year of their legendary caliber 3135 which is still being used today in Datejusts, Subs and others. And it has the T<25 dial. Its a collectible. Ref the above comment: should have said Rolex started with the letter prefixes after reaching serial number 10,000,000. Not 1,000,000. Is it that big of a deal if you do not have the box and paperwork that goes with the watch? Can you get replacement paperwork to go with the watch, if so where? On a modern watch, missing box/papers subtracts 5-10% from the value. Last I checked Rolex would provide authentication paperwork for under $200. This can replace some, but not all, of the lost value for missing paperwork and make it easier to sell the watch. If it is a vintage watch, the value of the papers can be much higher. I bought my 1987/88 “R” series Sub 16610 recently fron an old friend. Unfortunately he did not have the box, tag, paperwork, the anchor or even the links he removed for sizing. All of this can be replaced but the genuine stuff can be expensive. Of course these items will increase the resale value of the watch depending on what one spends to get it. Mine was made in the first production year of model 16610 and cal. 3135 and I will probably keep it. I will leave it in my will to a family member who very likely will not have the slightest idea regarding its value and couldn’t care less that it doesn’t have its original box and papers. Just purchased a submariner w/blue dial bezel.. It was indentified as item..PJ 20135 and the serial # begins with a R797:.. Followed by(IAXZ). Could this be one of the watches under discussion ..It doesn’t mention any model #11610 or cal. 3135 ? Hi Larry. A serial starting R7 dates it around 1987-88. The 16610 (stainless steel) never came with a blue dial. I don’t know what IAXZ or PJ 20135 stand for. I’d need to see some photographs to know what you are talking about. I am just curious to find out if there is any difference between Rolex Sub 16610 and 16610 NOS? What does NOS stand for? Would appreciate if someone could come up with an answer. Thanks a lot. NOS is typically a grading term used by sellers. It stands for “New Old Stock” indicating that while the piece is an older discontinued model, it is still new. Thank you PJ. Much appreciated. Also, I am planning to buy Rolex Submariner Hulk 116610LV. I dont know whether to go for 2010 model or 2015 which is the latest model. The price difference is very minimal. 2010 model is the starting year for that particular reference no. if I am not wrong. What is your advice? As there were no changes to those models between 2010 and 2015, year of production would be a secondary concern for me. My primary concern would be condition and completeness. The nicer, more complete watch would be my first choice. If both watches are equal in those respects, then I would lean towards the newer piece. Hello Kenny. The Rolex serial number of V327 should date the watch to early 2009. Submariner Date watches dropped their holes in 2003 with the Y series being the last to have them. The 16610 started getting the SEL band in 1999 with the A series. Hello there I have a April 2014 sub date 2 tone purchased from earnest jones. G87 the serial number starts with. It is the 2 tone blue ceramic bezel one. Today doing some DIY I’ve managed to catch the gold edge of the bezel right at 12 point and it looks silver underneath . I was to believe that all the gold parts on a rolex watch were actually gold ? Can some one confirm if the bezel is electro plated ?? £8950 it was seems expensive if the bezels aren’t gold. The bezel is solid gold, not plated. I can only recommend you take the watch to where you bought it with that question. I have a 1995 W series watch and it says “Swiss made” on the face instead of t<25. Can you tell me why and more about this please? Raj. It sounds like the dial could be a Rolex replacement dial. Since the T dials are no longer luminous, it would not be uncommon for it to be replaced at service with a dial with working luminous. Since the replacement dials use Luminova, not Tritum, there would be no ‘T’ on the dial. That is my theory anyway, you’d have to take it to someone local for a more certain answer. Buying a 2006 16613 Serial Z948! Should it have the engraved rehaut! I read online that the later Z serials were engraved? I have never personally come across a 16610 or 16613 with Z serial number that had an engraved rehaut. I do know of at least one Z series 16613 with rehaut engraving reported by John B. Holbrook II; I’m sure there are others. I have seen engraved rehauts on non-date Submariners as early as Z8 and solid gold Submariners as early as Z1! I believe Rolex began engraving the rehauts according to whatever they had in stock at the time that hadn’t been allocated and with no attention paid to the numerical order of serialization. I have decided to purchase a model 16610. Do you have an opinion for a specific year? Is a 2001 model sub worth 6900 pre owned. It’s in really good shape. . Since you didn’t say what model, $6900 is pricey for a 16610, but good for a 16613. Good Afternoon I have a two tone stainless/gold band black face 2006 thinking about trading for a 2014 in like new condition.what is your thoughts.No money out of Pocket.? I cannot answer that without more information, please fill out the form here – https://www.bernardwatch.com/TradeIn-TradeUp – for an offer. At the six most submariner models have marked swiss made mine just says swiss is this common? . Hi John, the “Swiss” only was used for a couple of years 1997/1998 and early 1999. I own one as well, no problem. I just bought a pre-owned 2007 Rolex Sub Date and did not realize it had the branded rehaut until I read your blog. Great news that mine is sought after because of the ROLEX.ROLEX.ROLEX. Thanks, a great help. I bought a 2007 Rolex Sub Date and didn’t know about the branded rehaut until I read your blog. Great news, thanks! I am looking to buy a 14060M Submariner, 2007 it has a case with spring bar holes and an engraved rehaut but I am confused with the year changes that took place, is it possible that a 2007 year watch have these two items and what movement is inside ? The 14060M will always have lug holes. Rolex did not make a no-date sub without lug holes. There were three years of production (roughly 2007-2010) with branded rehaut in the 14060M. These pieces will have a Chronometer certified Cal. 3130 movement and “Superlative Chronometer Officially Certified” will be on the dial. I’m considering a late 80’s submariner 16610 in a custom blue dial/bezel- excellent condition & priced firm at $6250- sound appropriate? My Submariner two tone with Hollow end links bracelet is stretched and I am looking for a replacement my local jeweler has a non-official Rolex bracelet that’s in great shape and wants a thousand bucks as a trade in for my old stretched bracelet but I like to collect gold and thought that might be a bit High since there’s a lot of gold in my current bracelet. Is that a good deal or should I keep shopping? Hi, Randall. We don’t get involved with aftermarket bands anymore. The last time we sold an 18k & Steel Oyster Italian made band was in 2007 and it sold for $700. So $1000 today for a high-quality replacement sounds about right. You can check with Bezels and Bands at 888-731-4050 for quality aftermarket bands. Sounds naive but I have been think of buying a nice watch for some time and all the information is news to me. So thanks for the detail. It makes me realise £3700 is a typical price in the UK but you can buy a fantastic authentic watch or a tampered one eg wrong bezel for the same money. So I will treat this subject with the respect it deserves and then get a nice example. I am planing to buy a new Sub, but have a dilemma: since i love the non date version but love the hulk color variant, do you happen to know by chance if rolex is planing to release that combo also for the non date? I am new in following rolex so if this kind of info exists, i couldn’t find it or i might of missed it. I am asking because i don’t want to spend that kind of money and a little later to find out it will be available also in that combo. Although I am not a fortune teller and Rolex tells their plans to no one… I strongly doubt that Rolex will ever release a green variant of the no-date Submariner. Rolex has always been extremely conservative in the variety of offerings in their sport models. Hello. I just bought a new Rolex Sunmariner two tone blue face…sunburst dial. 166613lb. How can I verify this is a new 2016 model vs a new 2013 model. Can you tell from the serial number? Sorry, but you cannot tell. Rolex uses a Random numbering system which obscures production data and they have been doing so since 2010. If you bought the watch in 2016 and that is the date on the warranty card, then simply consider it to be a 2016 model. I have a blue two tone i bought in Fiji in2000 on my honeymoon. Gone is the wife and i want to change the watch to the black and gold. Pros? cons? We advise everyone keep their watches original and not modify them with other parts. It’s generally a better idea to trade in the watch in its original state and find the 16613 with black dial you desire. It’s not cheap or easy to get original black bezel and dial to swap, and Rolex does not approve of such alterations. As I am thinking of possibly getting a used No Date Submariner, can you please give some advice about a 2005 model (Z5xxxxx but very little other info at present) which does not have the “Superlative Chronometer Officially Certified” on the dial. How does this particular model differ from those with it? Does it have a different and less good/accurate movement? Asking price is about $5600 equivalent here in the UK. Would I be better waiting and saving for a newer model? The 2 no-date Subs from the 00s are often referred to as the “2 line” or “4 line”. They have the same movement. The newer Chronometer ones just went through the extra step of being COSC certified. So in theory, yet, it should be more accurate. That sounds like a fair price for a Z serial in good shape with boxes and papers. Assuming that’s buying from a dealer with some guarantee protection. If it’s a personal sale, I’d be a bit more careful. the watch is a black & gold two tone but the buckle is only silver, is the guy i bought from him do some adjustment there or it originally comes like this ? The so-called ‘gold through’ buckle was not introduced until around 1999/2000, so a 1997 production would have a steel buckle. Hi, I was wondering what would be considered a good deal on a submariner ‘hulk’ new or pre-owned mint? Thank you! I may be biased, but we have a 2013, Mint in Box/Papers at $7,950, which I think is a fair price in the current market – http://www.bernardwatch.com/list.cfm?search=116610LV – A ‘deal’, and by that I would mean “a below market price”, is going to be extremely hard to come by since the Hulk Submariner is typically rare and known to be desirable. I wear a 2000 submariner date in stainless steel, but to me it occupies the virtual space formerly taken up by my ‘red letter’ 1975 Submariner, which was taken in a burglary. That watch would have been quite valuable now, I believe, and I had a particularly sentimental attachment to it: my two great aunts in Glasgow died in quick succession (never having been apart in their lives) and in their will did something very surprising and most unScottish. I inherited 250 pounds, with the instruction “Julian should buy something he likes.” Not “invest for university” or “put into a sensible stock.” My affection for those women remains undimmed. Accordingly, I wandered into Mappin and Webb on New Bond Street in London (this was a year before I came to the States for college) as a diffident teenager, and looked at watches. The Pulsar was just out and a big thing then; I believe it cost 250 pounds. I contemplated it, but in the end (phew!) settled on the Submariner, with was then 230 pounds. Like many decisions I’ve made in my life, this one turned out to be precisely correct (the Pulsar was, of course, rapidly nothing more than junk, with its beady little red screen and minimal functionality..). So the red letter ran like a champ, with one intermediate full service, until it was stolen, along with all my wife’s inherited jewelry. Because she knew she could not replace that, and because she is fabulous, she said “you should use the insurance money to replace the Rolex.” I would not otherwise have been able to afford to do so. So shortly a box arrived from “State Farm Jewelers” (!) in New York and I was up and running again. A small coda to the story; the 1975 watch’s strap had become less and less workable, links loosening and the little clasps on the buckle bending out so they didn’t engage; the price of the Rolex part was out of reach for me then, but I had a friend who made multiple trips to Asia for business, and commissioned him to find me a decent knock-off… The strap fit the watch and looked at least plausible, so I put it on. The burglars, therefore (for whom I have nevertheless some affection as they carefully closed up house and left both cat and dog inside), got away with a horrible hybrid of fakery, and I ended up with a gleaming new Submariner. I still have the fake Submariner which, hilariously, has a crystal case back. It’s actually a useful comparative study, since it reminds how the Rolex is superlative in every detail. I only have one Rolex, but I love it It’s a stainless 1987 5513 Submariner which I purchased new in Freeport, Grand Bahama. It’s been rebuilt only once and still runs like a top. I don’t wear it everyday anymore opting for my orange Doxa SUB 4000T instead. My Rolex gets pulled out for special occasions and worn proudly. It’s funny that when I bought the Submariner, the idea of wearing a “sportswatch” for everyday wear was not a common practice. I got comments on the style of my “fancy” watch. Plus, I remember plenty of people asking me back then how I could wear such a huge watch on my wrist. That’s funny given that a 1987 Submariner is pretty small by today’s standards and especially so in comparison to my Doxa which demonstrates how tastes have changed over the years. The interesting thing about my 5513 is what it’s worth these days. I recently had it appraised for insurance purposes and was shocked at the amount. Needless to say, but it’s current value is many, many times what I paid for it. For me, it’s not an investment, but simply a treasured possession that I’ll never part with. Besides, it will become a family heirloom someday as it’s in my will to my youngest son. I don’t know if he’ll wear it either as he has a titanium Omega Seamaster that he really loves. Nigel, thanks for sending photos, the fancy B is likely correct (I can’t verify authenticity remotely). A company named Beyeler made dials for Rolex for many years until Rolex bought them out. I am looking to purchase a 2003 black face submariner with holes in the case, is it real? The reason why I ask is I’ve been told that 2002 might have been the last year they were made with holes in the case. Rolex doesn’t start/stop production on a specific date. If we are talking about Submariner Dates (16610 or 16613) made in the Y series which ran from the fall of 2002 through the fall of 2003, there are likely as many with lug holes as without. I have even seen early F serials (winter 2003 production) with lug holes. Submariner models without date (14060) were always produced with lug holes, even into 2010 (the last year of production). The model number should be located between the lugs at the 12. The serial number should be located between the lugs at the 6. First off, thank you so much for taking the time to answer questions here. Your information is invaluable! Now my question is in regard to 2 different era’s of the Submariner 16610. I have the chance to buy either an all original 1989 “L” serial Sub Date (in pristine condition) with nice even creamy yellow patina throughout, or a 2004 “F” serial Sub Date (in pristine condition) with the upgraded SEL’s and Superluminova… Both watches are complete with box and papers, and both watches are priced within $200 of each other ($5,800 & $5,600) respectively. With all of that in mind, which would you purchase, and why? James, I think the answer would depend on the state of my collection. If I were shopping for a watch that I would wear most days, I would pick the more recent Submariner for the modern features and construction. However, since I do have a collection with some variety and several modern pieces, there is room for a vintage component. The completeness and originality of the 1989 piece makes a strong argument for it as a wise vintage purchase. — P.J. Thank you for reaffirming my feelings. I believe the vintage piece would be a nice score since the condition and completeness isn’t something you come across everyday. I keep telling myself that I can always get a more modern Sub in the future anyhow. This is cool comparison. I have an older Sub exactly like the one shown with the holes, tritium and SEL bracelet. According to the serial number on the case it’s a 1980 model. I used to want to trade it in for a newer one but I don’t think I’ll get rid of it since it sounds like more of a collectors item. My only gripe is the half-life of the tritium and no lume glow anymore but I can live with it. Especially if it starts to develop a patina in time. I’ve had mine since it was given to me by my Chief, when I made 1st Class Diver. 1975. Yes, there has been variation in the color of dials, including some blue dials that started with a darker color or aged quickly to a purple tone. I believe this was due to the sourcing of dials at the time. Rolex has since consolidated their manufacture and now make dials in-house. Many thanks for the really useful information. It helped to confirm the approx age of my 16610 – and that it is a genuine Rolex. A famous name jewellers shop in Bournemouth told me they wouldn’t part-exchange my watch for a new Explorer because there is no serial number on the outside rim of the case. I was puzzled and worried because I bought the watch in Selfridges and have returned it twice for service and repair, so it should be genuine. The answer is that my watch is a branded rehaut model circa 2009, with the serial number engraved along the rehaut at the 6 o’clock position. I just picked up an A series 16610 and notice the bracelet does not click back into non-locking end of the clasp and swings free when not on and against my wrist. Is this normal for the production year of this model? I read this was common with 93150 bracelet, but was this used on the 16610? Thanks. If you are referring to the diver’s extension, yes, that is correct for a 93150 bracelet on an A series 16610, it does not lock into the buckle. The diver’s extension would lock into the buckle on a 93250 bracelet.